I like the valences you picked. Fancy. Thanks! I hope they work in my room. Thank you! 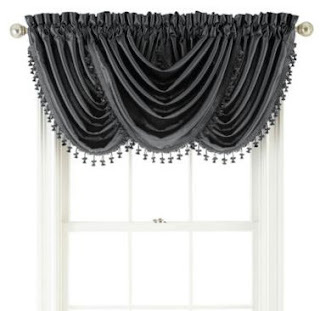 I love the elegant layered look of Victorian style window treatments. I LOOOOVE the valances! And the wall color is excellent; I think I like the new color a bit better than the original one. I think I'm getting jealous. Your place looks SO much better than mine!!! I love that the paint is called wizard's potion! I think the slightly lighter shade is nicer too. Cannot wait for the big reveal!! They are both nice colours! And Wisard's potion is a great name! I believe I chose my room colour Sky Boat Blue as a kid because it reminded me of the The Skye Boat Song. Cannot wait to see the final thing! I'm currently living in a partially finished bedroom myself. The only thing in there is the bed, and not even on a frame, since the floors are installed, but not finished. We've had to put the remodel on hold, since some work stuff came up that requires our attention and money. I'm jealous that your room is almost done and over how wonderful it looks. Great job! Thank you! My room was partially finished for a ridiculously long time. :P It was furnished and functional... but not finished. I am at war with my crown moulding/coving... The polystyrene stuff the previous owners of the house put up is all wrong and squiff and badly jointed. It is going down. I hope to replace it with this: http://www.ukplaster.com/acatalog/Cornice_CN166-55.html but it is a) expensive and b) plaster. My walls are also not straight, because my house is old and old houses are never truly straight.